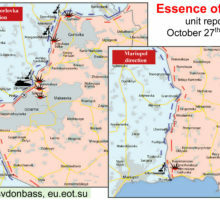 As of 22:30 Moscow time (20:30 in Berlin), intensive trench combat with the use of artillery and large-caliber machine guns takes place on the northern outskirts of Donetsk, in the area of the airport and Avdeevka industrial zone. 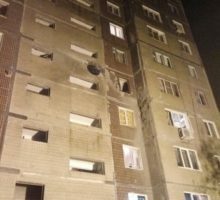 Residents of Kuibyshevsky and Kievsky district of Donetsk hear powerful explosions. Today our comrade Goodwin celebrates his birthday. 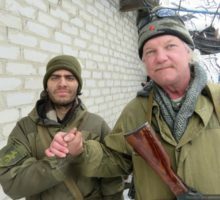 In January 2015 Goodwin and another Essence of Time unit in Donbass militiaman, Accord, came under mortar fire in Donetsk airport. Their legs were heavily injured by the shelling. Goodwin managed to provide first aid to Accord and saved him from dying of blood loss. Goodwin returned to combat positions despite the fact that after a number of complicated surgeries his leg never fully recovered. 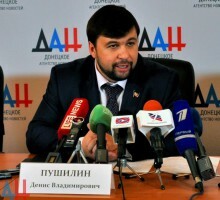 Donetsk People’s Republic (DPR) continues to gather the materials for the future trials against the Ukrainian military responsible for war crimes, DPR People’s Council spokesman Denis Pushilin claimed during the opening ceremony of the “Soviet Nuremberg” exposition dedicated to the military tribunals against Nazi criminals in the Soviet Union. 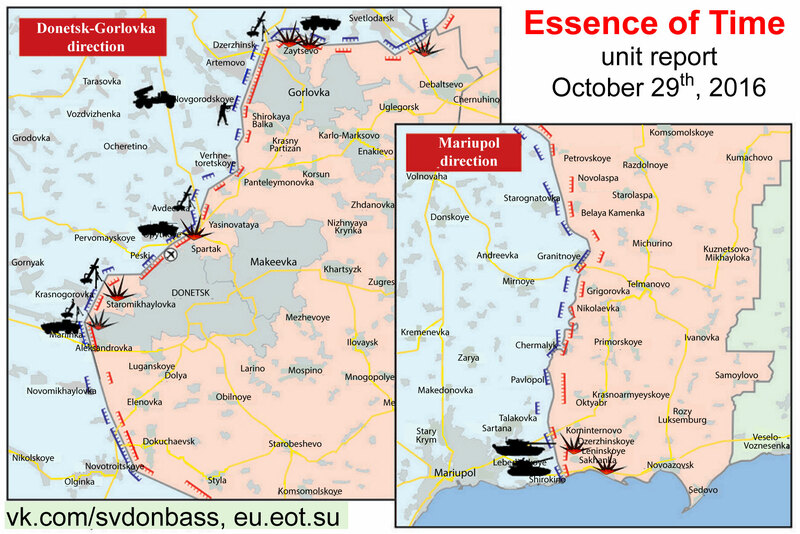 Ukrainian military once again shelled Golmovsky and Zaytsevo villages on Gorlovka direction. 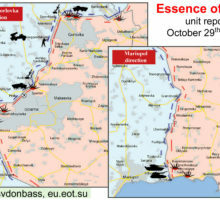 By the evening trench combat erupted on the north-western outskirts of the city. 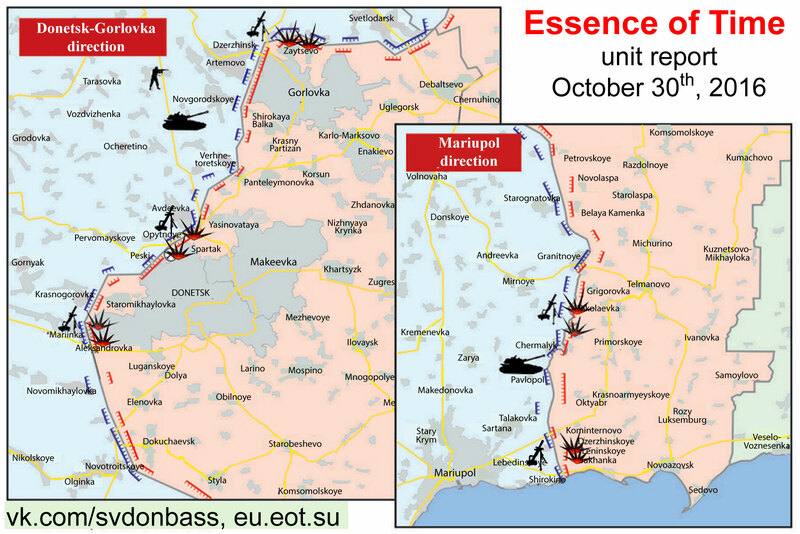 The enemy fires mortars, automatic grenade launchers, IFV guns and small arms. 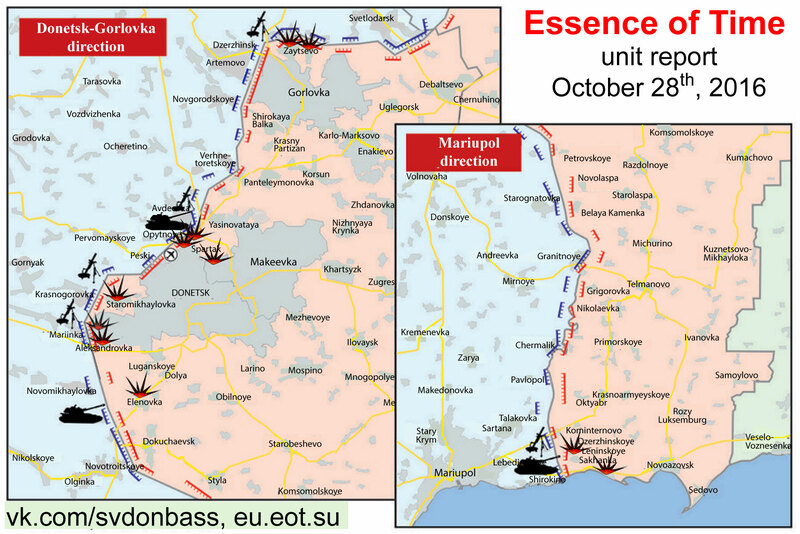 Ukrainian military continues to shell towns and villages on Donetsk and Gorlovka directions. 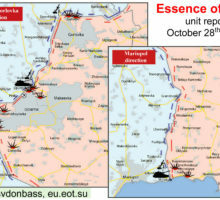 Recon regsitered facts of arrival of military hardware, ammunition, as well as foreign mercenaries to the frontline. On October 28, the Day of Liberation of Ukraine from fascist invaders, Bandera Nazi revenge seekers shelled a number of towns and villages of Donetsk People’s Republic on Gorlovka, Donetsk, Dokuchaevsk and Mariupol directions. Happy birthday Kontrabas, Mars and Altay! Today we congratulate three of our comrades on their birthday at the same time — Kontrabas, Mars and Altay! These guys stood up to neo-fascism and every one of them is currently an acknowledged expert in their field. We wish you spirit, endurance, solid health and victories on all frontlines! Stay safe! 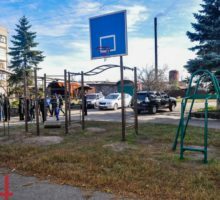 On the initiative of the Donetsk People’s Republic (DPR) Ministry of Industry and Trade, state-owned company “Donetsk Power Plant” constructed two playgrounds in front-line Debaltsevo. The opening ceremony of the playgrounds took place on October 27th and was attended by the local residents. Tense situation is being registered along all of the frontline. 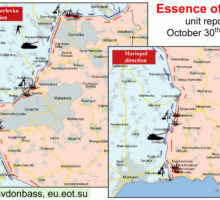 The intensity of shelling increased as compared to past several days. 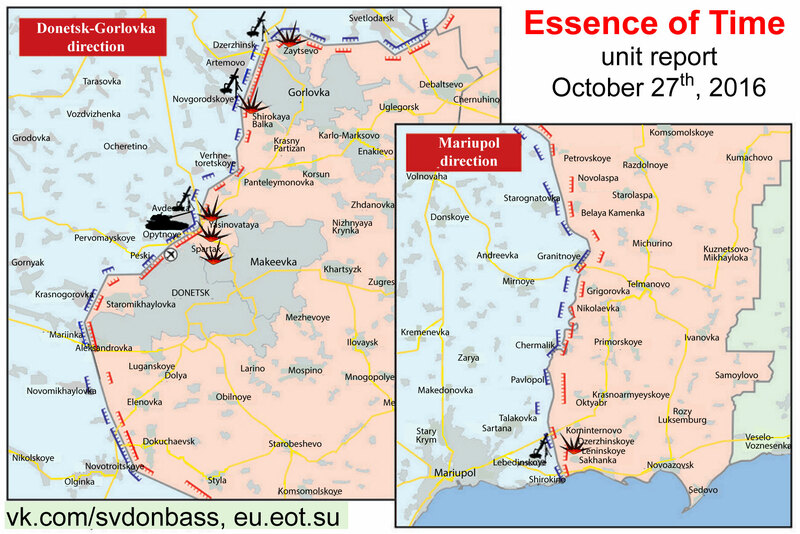 Makeevka was hit by a massive shelling by Ukrainian army. Several houses were damaged in Kirovsky district of the city, people were killed and injured. 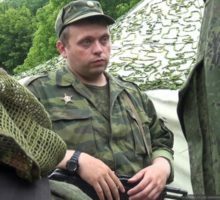 Chief physician of Interior Ministry hospital Andrei Zhurbin was killed on 7, Gazetny alley, his 6-year old child is wounded (according to other sources, also killed), his wife is in a state of shock. Another civilian was killed as a result of a hit on 10, Stroitelei str. Another hit has been registered on 73, Kokkinaki str.